Special package for Winter! Now is the time to make sure you are getting good nutrients for your immune system and keeping your metabolism up. Cozying up to the fireplace to stay warm, watching the snow fall and eating all those wonderful holiday and winter goodies may just pack on a few extra pounds. Sometimes we need a little help with trimming and toning. Trim your waistline and other body parts with our LeptiTrimBody special combo package! (includes 3 of our top sellers for your weightloss and inchloss) These 3 products retail at $167.94 + shipping. We want to help you save your hard earned dollars and keep your waistline trim. Get your Special combo now! Just $112.85 + only $5.00 shipping! Click on Combo Package to order. Limited time offer. Participants lost over 20 inches during the 3 month study. Incredible! Click on the weightloss link to see more! Take the weight survey and fill out the health questionaire by clicking here. She lost this with no surgery! This is a 20 week loss! Order Now! The one and only Lepti Trim6 inch loss system formulated by Dr. Anthony Kleinsmith. Click on the weightloss link to see more! Colostrum contains all 87 natural growth factors, over 95 + immune factors, all of your essential factors, metabolic factors and the vitamins and minerals your body requires. It is available in its pure encapsulated powdered form with no fillers. Click here to read how Immune Tree Colostrum can enhance your health plan providing protection against bacteria, toxins, virus and disease. 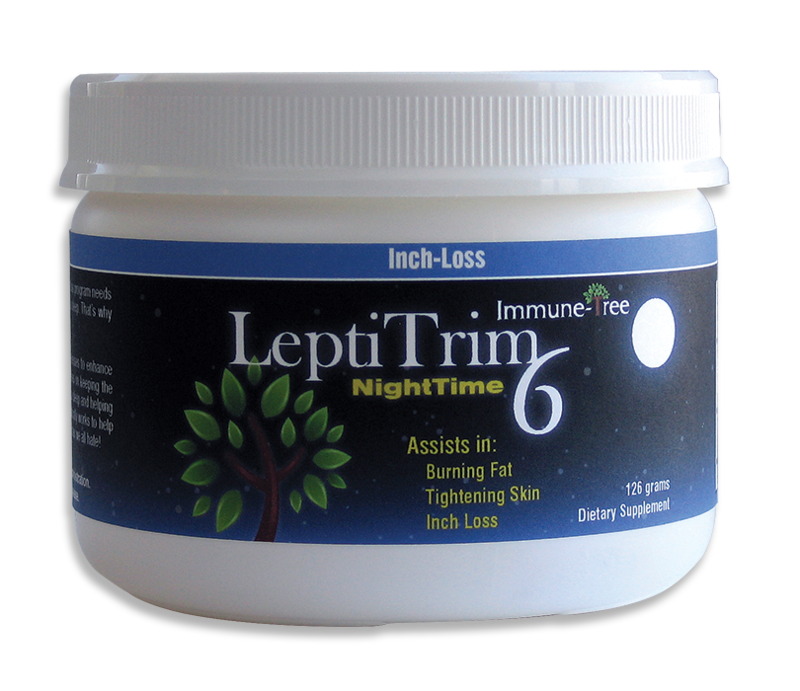 The Lepti-Trim6 NightTime is a potent Collagen Protein. This unique formula works with your body’s natural processes to enhance inch loss ALL NIGHT LONG! Insulin levels are lower while you are sleeping and this allows for body fat reduction and lean muscle development while you dream. Filling the communication gap between your stomach and the Hypothalamus, the overeating mechanism, puts you in control of how much you eat. Cleansing the cravings for sweets; it isn't wrong to want "some" sweets, but most people find they aren't in control and overindulge. This product will help limit the amount of bad carbohydrates. Balancing the body's thermostat, thyroid, for a better, natural thermogenic burn, but without stimulants. The best energy source is "FAT" and by getting your thermostat working properly you can experience much more energy and lose inches. Increasing your lean muscle mass, a large part of your fat burning engine, allows you to burn more calories, which again shrinks us down to size. Balancing body chemistry helps to overcome insulin resistant weight gain and has a positive impact on your adrenal functionality, not to mention your blood pressure. Listen to the formulator of Lepti-Trim 6 Daytime capsules (formerly Accelerated) an amazing breakthrough for our weight loss and inch loss. This drink isn't for lightweights! The LeptiTrim6 Chocolate and Vanilla Shakes are another "tasty" tool in your war chest for long-term, successful inch loss. Mix two to three scoops in 8-10 oz of water, milk, or your favorite liquid. Or blend it with frozen fruits and create your very own smoothie. With 27 grams of protein per serving and a natural substance called "Leptin", found within the Colostrum6. Leptin literally works on shrinking fat cells among other things. What makes this such a powerful formula? A natural source of the IGF super family and the hormone-like protein leptin. Both Leptin and the IGFs increase the body’s ability to metabolize excess energy stored in adipose tissue (to burn fat) and control appetite inducing hormones; for a leaner body and a stronger will to control what you eat. Superb Antioxidant that helps slow aging, repairs liver damage and reduce the risk of Cancer, Heart Disease and Diabetes. Increases the use of fat as a source of energy. It prevents fatty build up - especially in the heart, liver and skeletal muscles. Since it is involved in fat metabolism, carnitine helps to lower triglycerides and support weight loss. Is a fatty acid, which affects fat metabolism and is being shown to influence the balance between fats and muscle. ontains the active ingredient known as HCA (hydroxycitric acid), which naturally curbs excessive appetite and prevents the body from turning extra calories into fat. It supports the storage of glycogen in the liver and muscles rather than as fat and activates thermogenesis for the burning of excess fat. Contain natural, bulk producing, soluble dietary fiber derived from fruit and plants. Provides the benefits of hemicelluloses (gum and pectin) and polysaccharides, which are so important for maintaining the proper pace and bulk required for healthy digestive function. There are differences between whey protein isolate and whey protein concentrate. Whey protein isolate has a higher protein content and is lower in carbohydrates, lactose and fat. But it is typically more expensive due to the additional manufacturing process it undergoes. Whey isolate is especially beneficial for you if you are lactose intolerant and can not digest the lactose in whey protein. The highest-quality protein known to science. Enhances anabolism. Stimulates the release of the hormone glucagon, which stimulates fat burning. Enhances lean muscle development and also reduces appetite. The ratio of sodium to potassium is is critical for muscle contraction, according to the Linus Pauling Institute at Oregon State University. Low potassium can cause muscle cramping. Potassium is also necessary for the building of muscle. ound in fruits and cruciferous vegetables. It is used as a natural sweetener, and is sweeter than sugar cane. 300 times sweeter that sugar and offers no side effects. number of electrolytes, and many trace minerals, including a high content of the mineral germanium, which accounts for its properties as an oxygenator at the cellular level. Other active compounds include plant sterols, which support the immune system. Is a building block for all other amino acids. It is also a key component of bile, which is needed for the digestion of fats, the absorption of fat-soluble vitamins and the control of serum cholesterol levels. Taurine is vital for the utilization of several minerals including calcium and magnesium. Helps to build lean muscle, (it is the basis for the building blocks that synthesize DNA and RNA.) Glutamine is important for dieters and body builders to prevent muscle breakdown and is involved in maintaining a proper acid/alkaline balance in the body. Plus vitamins, minerals, enzymes and amino acids, essential to your body's ability to balance levels and "let go" of excess fat stores. This results in inches, pant or dress size reduction. 370 Grams; The LeptiTrim6 Cleanse formula developed by Dr. Anthony Kleinsmith synergistically combines vitamins, minerals, amino acids and enzymes to nourish the body while aiding healthy elimination. These ingredients work together to aid in the digestion of food, increase energy and cleanse the colon of stored waste. When you blend up the LeptiTrim6 Cleanse as part of your daily regime, you receive 100% of your RDA on Vitamins, and 50% of your RDA on Calcium, Potassium and Magnesium. We call Flex6 Complex from Immune Tree the essential formula for athletes and bodybuilders. Flex6 truly is one of the world’s most powerful blends for athletic use. With the constituents found within, it’s no wonder that more and more athletes and bodybuilders are turning to Flex6 as a safe, natural way to build lean muscle mass, improve strength, enhance endurance and recovery time. Athletes recognize that having a lean body with minimum body fat is a major factor in maximizing their potential. They place heavy demands on their body through strenuous exercise, which results in the burning of protein and makes it difficult to build new muscle. Flex6 can play an impressive role in the building of new muscle, allowing the athlete and non athlete alike to burn more fat and gain more muscle, enhancing the overall performance of their muscles. These statements have not been evaluated by the FDA. This information is for educational purposes only. This product is not intended to diagnose, treat, cure, or prevent any diseases. Your results may vary.